In Smash Bros., there is a plethora of regular characters in addition to the numerous Assist Trophies. If you add the number of characters that appear as regular Trophies, you’ve got quite an impressive line-up. Ultimately, that’s something that we could only achieve with Smash Bros. as it was based on the question of how we might enable players to enjoy the multitude of characters being brought together in one game. With games centred on the world of just one character, there’s a limit to the characters that can make an appearance. Since Smash Bros. is one of the few titles where it’s okay for characters to mix, you feel compelled to make the most of it. So it is done out of consideration for our players. Right. I think there are times when people making games are unaware of how much people love their characters or how much players want to see them in places not directly connected to the games in which they appear. I myself, when designing Kirby’s Dreamland, was largely unaware of the places where Kirby characters were showing up outside the game. As you have the opportunity to talk with fans though, you realise just how much people love these characters. To fans like this, seeing an individual character in another game, even if they don’t move, makes them really happy. So that’s why you try so hard. Although it’s simply a case of modelling the trophies, you have to design them in a way that fans will be happy with. This must take lots of effort. Right. The development for Smash Bros. Melee began soon after the GameCube was released and we had to design each character from scratch. This time, however, we were able to borrow characters from various development teams, which was a big help. Take The Wind Waker and Twilight Princess from the Zelda series for example. We were able to design the Smash Bros. characters by adapting them just as they were modelled for the original titles. So you used our — which sounds strange — data of the official versions. Right. Official versions. (laughs) Which means you’re able to see the undersides or backs of the characters. They might be slightly different though. Oh, I get it. In other words, Super Smash Bros. Brawl enables you to see another side of the characters you aren’t able to see in our games. Right. And you can look as much as you like. 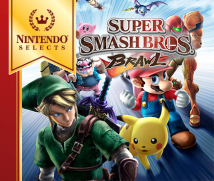 Of course, that doesn’t mean you can simply take characters from recent games and turn them into Smash Bros. Trophies. We also incorporated many characters from older games, as well as some more nostalgic items. 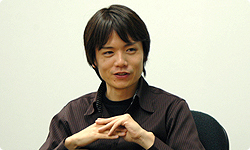 Which is why you went all around Nintendo collecting data and materials. I asked around for people to excavate these old documents myself. Right. I owe our thanks to a lot of people. 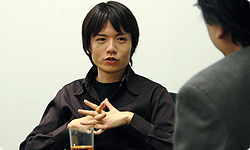 So, you used data and models from new games, and 2D illustrations, manuals, game boxes, and illustrations used in advertising materials for the older games. I borrowed a lot since there were many things players wouldn’t otherwise see without this opportunity. And, I didn’t simply receive materials, I also had to have them edited. Which is one of the reasons your staff figures reached 700. Also, I don’t know if it’s okay to talk about this or not, but there is a sticker feature this time around. Can you tell me about it? Sure. Throughout the game, you can collect stickers just like Trophies. This isn’t just for collecting, however, as each sticker possesses a power-up ability. If you put it on a trophy stand, you can strengthen that character little by little. (See document) You can then use these powered up characters in The Subspace Emissary mode. It’s interesting that the size of the stickers requires you to figure out how to fit on a trophy stand with limited space. Right. If you’re able to power up characters unlimitedly, it would lose its appeal. So this ability to customise characters with stickers is a fun new feature that wasn’t available in prior titles. Right. Until now, trophies were simply something you collected. Collecting items based on regular gameplay was standard in games in the past, but I wanted to use the stickers to bring the collection feature full circle and have it impact regular gameplay. By the way, if you’re a fan, these stickers are bound to bring a smile to your face.